I’ve been meaning to talk about the Kildare Patch line for quite awhile now, and with James Foster’s Pipes Magazine article on Peterson’s acquisition by Laudisi appearing today, now seemed an opportune time. I say that because he and I chatted last Sunday morning over coffee & pipes and one of the things that came up is talk on the various forums and in social media about Peterson quality control. 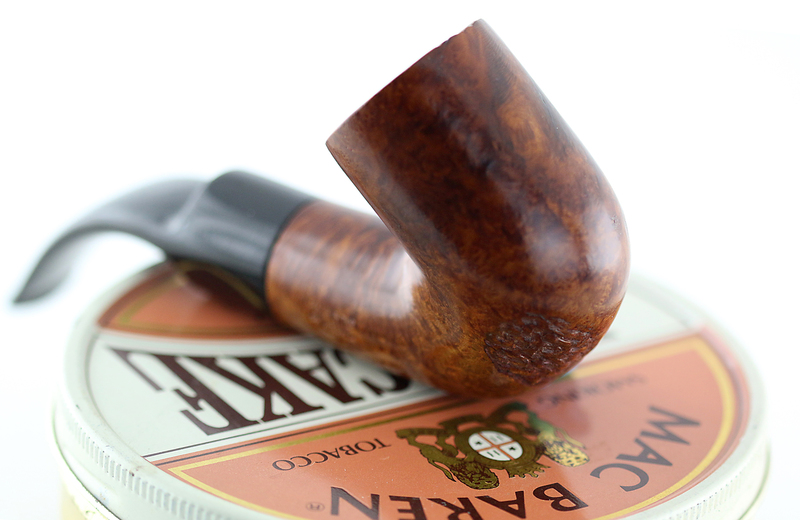 The Kildare Patch illustrates the long-standing realities of Peterson production methods and for that reason makes a great case-in-point about what pipe smokers can expect when they acquire entry, mid-grade or high-grade Peterson lines. 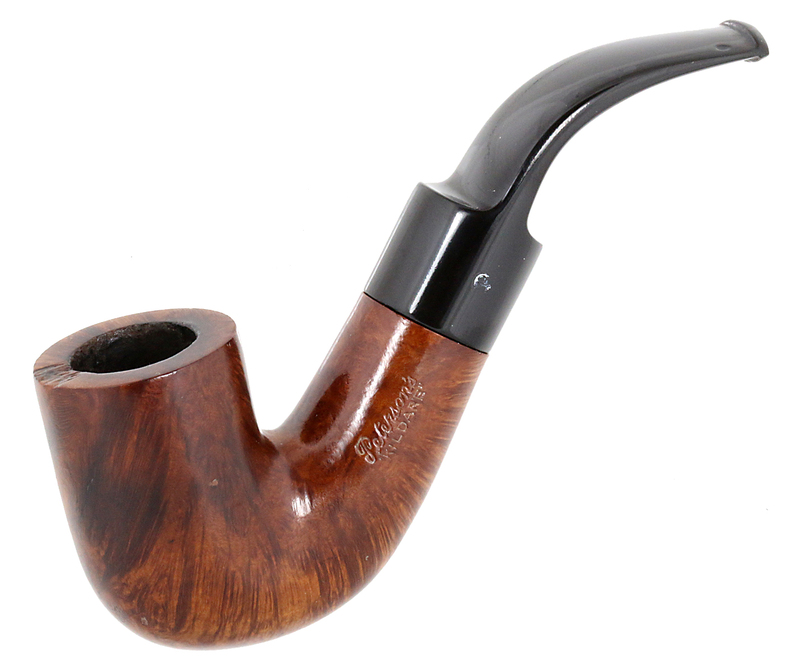 Kildare 1965 – First issue of line with matt finish smooth pipe in the Classic Range, P-Lip and fishtail. Second issue c. 1979 as Kildare Patch, with rusticated patches on pipe surface. Third issue 2010, brown matt, P-Lip or fishtail, no band. 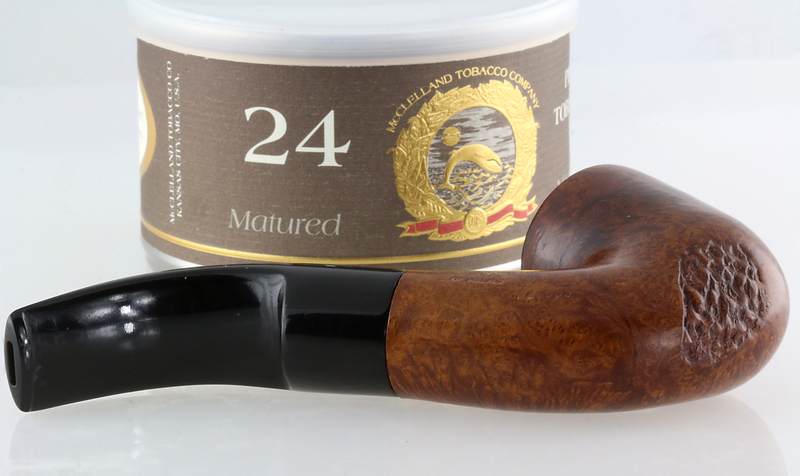 Fourth issue 2011– , burgundy sandblast, nickel army mount, fishtail, exclusive to Smokingpipes.com. See Etched. Peterson wasn’t ever one of the largest pipe-makers in the world—I think Rossi in the Varese province of northern Italy may hold that title, with something like 400 workers at the peak of their production—but like other factories, Peterson has always graded bowls in a particular shape from highest to lowest. Now the Kildare, and the one you’re looking at in particular, is a great example of a typical entry-grade Classic Range Pete, comparable perhaps to today’s Aran line. While this pipe was drilled with a System reservoir, it didn’t make the cut for Standard System grade. You can see there’s a putty fill on obverse, but then the craftsmen ran into serious issues putty couldn’t deal with at the base of the bowl and maybe on the rim. Still with me? Let’s take a pause and look at some bowl statistics in order to understand the third solution. Let’s say Peterson orders 500 bowls of shape 4. That’s the bowl number assigned to catalog shapes 4S, 309, XL339 and XL339S back in 1979. So, they sort them by grade and size. Being wood, some come out a bit larger than standard for the 4S / 309 / 79 shapes, so they go into a basket for the XL339 and XL339S (saddle). Now in that basket, Peterson routinely finds about 3-5% that are of the highest quality (remember these are ebauchon and not plateau blocks): maybe there’s a STRAIGHT GRAIN or a few FLAME GRAINS or some dense paisley-effect birdseye (my personal favorite). The tip-top will be gold-banded. Do you see them on the market? I doubt it. Doing the math, you see what Peterson mostly deals with: entry and mid-grade bowls. And where are the price points for most Petes? Same place. So now for the third solution. There are just the two problem areas on this XL339S bowl, so it’s been disqualified from the full-rustication treatment of the excellent Donegal Rocky sterling-mount line (and those old DRs really are something). Driving through the country, somebody looks out the window and seeing cross-cultivated fields gets a really brainy idea: if you’ve got some nice-grained briar with one or two serious problems areas, instead of shooting them down to the REJECTS basket (they do conform to shape and size, after all), why not partially rusticate them? I’m sure other companies have done the same, probably before Peterson (I don’t know), but this is the solution they applied on the Kildare Patch, the Sculpted System, and a few other lines around that time. 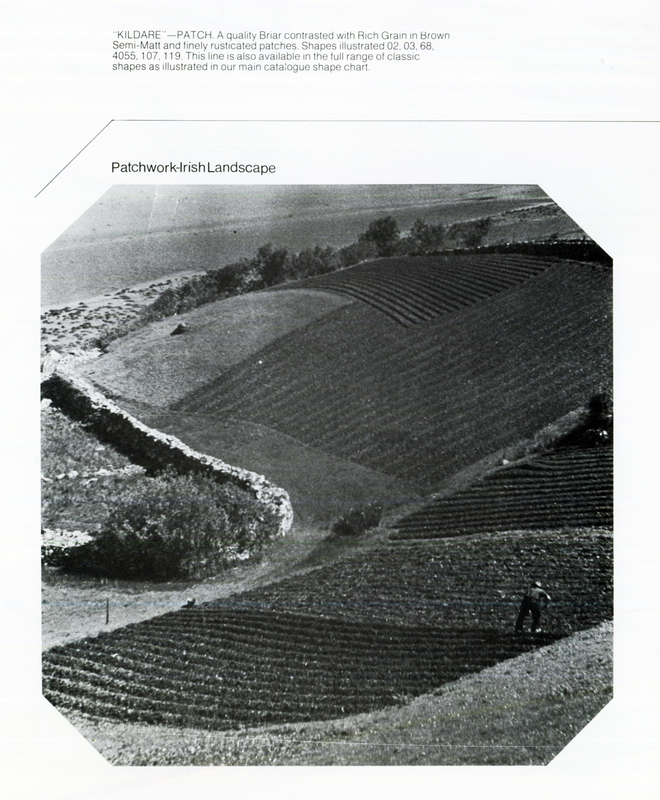 In the 1980 Peterson & Glass distributor’s price list, suggested retail for the Kildare Patch in this shape was $9. As a Standard System 309, it was $10.45; as a Premier 309, $19.50; and as a De Luxe 4, $34.75. Gold-mount? $105. Clearly the Kildare was an entry-grade line, then. At the time, part of the appeal for the type of partial rustication seen on the Kildare went back to what we called future shock—what I sometimes call the “faded blue jeans syndrome.” Things were changing too quickly and everyone wanted something that was not only comfortable but tough and looked as if it had already taken whatever punishment life could hand out. 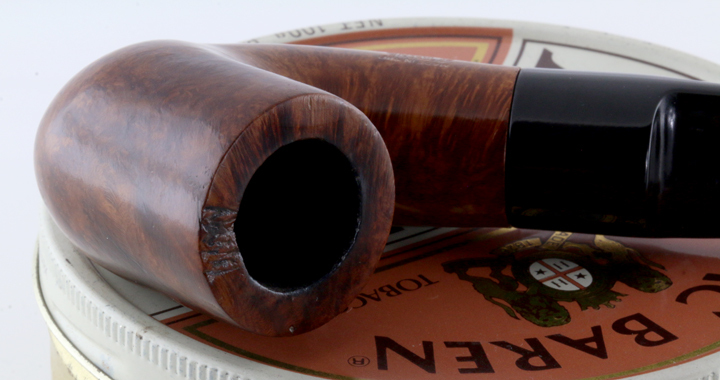 Unlike pipemen of today, most of whom want to keep their collection in as pristine condition as possible, pipe smokers of the late 1970s and 1980s felt they wouldn’t have much street cred if their pipes didn’t look well-used and a little beat up. Sure the green mouthpieces tasted awful, but everyone knew you were an experienced smoker. The “Patch” idea was a natural for its age. So what does the Kildare Patch have to teach us about Peterson’s quality control today? As far as I can see in my study of the company over the past seven years, not much has changed. Factory pipes using ebauchon blocks will always have imperfections, and Peterson has always followed the old European grading protocol for its bowls. The higher the grade the pipe, the fewer fills you should expect according to that maker’s grading system. The quality difference between the old Shamrocks and the Dublin & London or De Luxe lines was pretty much the same as the difference between today’s entry grades and highest lines, in comparative cost and quality. If you’ve been listening to the Alan Schwartz interviews on Brian Levine’s Pipes Magazine Radio Show the past few weeks, Alan relates an anecdote that pretty much goes to the heart of the matter: If you buy a factory pipe, you get a factory pipe. If you buy an artisan pipe, you get an artisan pipe. Know what to expect and what to look for in each. It’s the old caveat emptor / “buyer beware” thing. 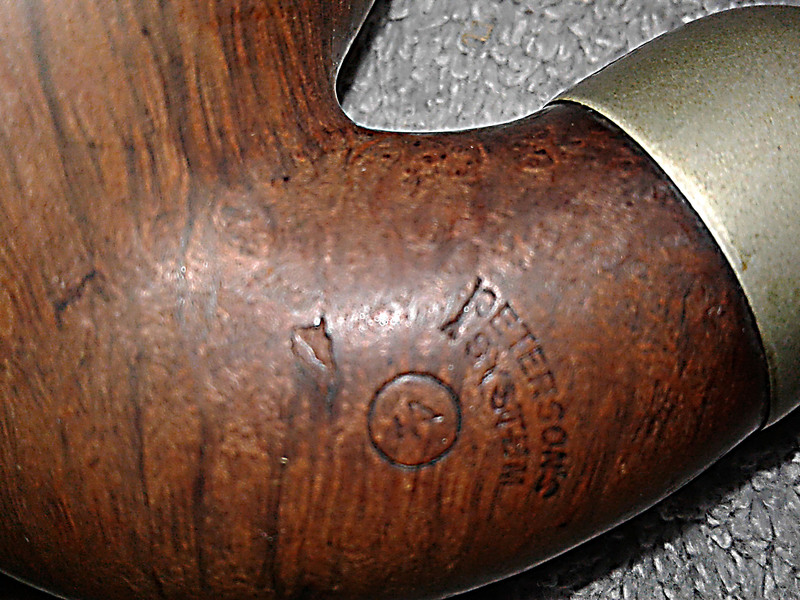 Peterson’s quality has actually remained fairly consistent over the years. What has changed is an increase in the number of lines and finishes (which have increased exponentially) and a concurrent decrease in understanding about how to determine the quality of those lines by finish, stain, mouthpiece and mounting. At the end of the day, I guess it’s just what rings the bells for you. 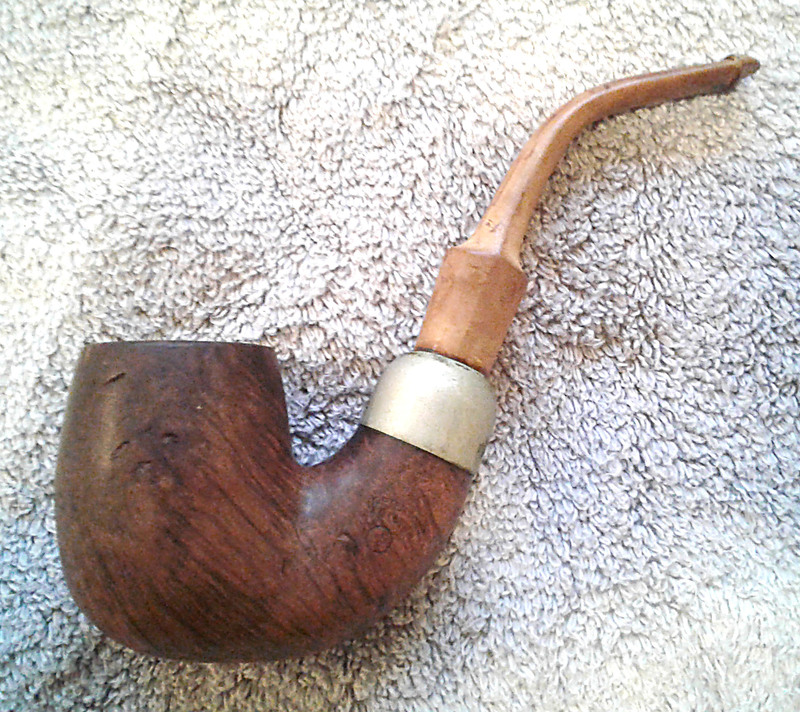 James Arrington sent me a picture recently of a Peterson O.2 House Pipe, Grade 4, from the Irish Free State era (1922-1937), and does it have fills? You bet. But instead of lamenting about it, we were both excited, as crazy as that sounds, because Grade 4 Systems weren’t even in the official catalog. Imagine. Something we didn’t know about Peterson. An IFS O.2 House Pipe–how cool is that? Fight the Power of Conformity! Tom, as always, you’re most welcome. Thanks for reading! Very intersesting, and similar to what GBD did with their Tapestry and Fantasy finishes in the 1970’s. (those had a combination of smooth and rusticated panels, the smooth in geometric shapes). I suspect that those grade pipes paired up quite well with leisure suits of the time. Ouch! Leisure suits! Did you have to bring those up? I’ve tried to burn every picture of my youthful sartorial indiscretions… thought I’d forgotten all about the Absolute Nadir of men’s fashions, and you bring those up. LOL. As usual, an interesting and informative blog post where I have learned something new about Peterson again. Thank You Mark for your dedication and preserved information on this Historical and Important Pipe Company. Thank you, Andre. BTW, the book’s off to the indexer. I can’t express how relieved I’m feeling about that. Right now is a good time. Every DeLuxe I’ve seen lately has been in the Natural (top of the line) bowl, with the impressed aluminum P (not always a feature of these pipes) and the new and much improved acrylic P-Lip. I’ll send you my address if you buy too many! Thanks for the shout out, Mark ! It is a remarkable pipe. Really looking forward to seeing the finished product !